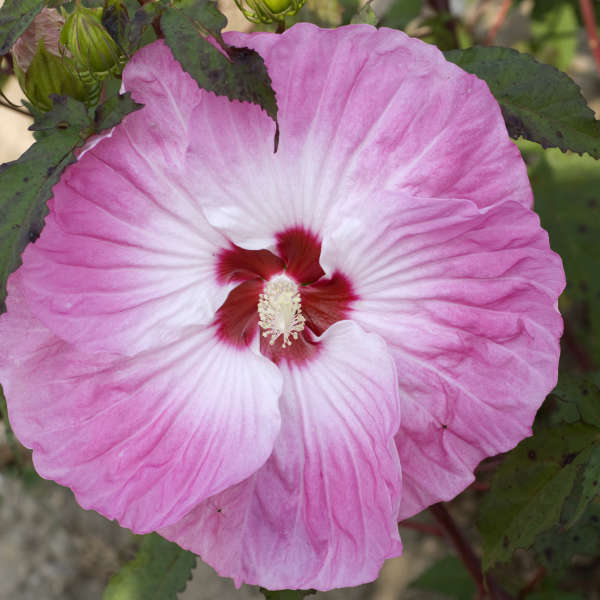 Hibiscus 'Tie Dye'. You'll love its huge 8-10", bright pink petals with a white bull's eye and cherry red center, but youï'll be even more impressed by its improved habit over 'Turn of the Century'. From midsummer into early fall, showy ruffled flowers of thick substance are produced at several nodes up the stems with flowers appearing on all sides of the clump. Healthy green, maple-like leaves on branched stems form a sizable clump in the landscape. 'Tie Dye' is suitable for planting en masse in the back of the border or planted singly as a late summer focal point. PPAF.